Ovarian carcinoma is the most lethal gynecologic malignancy. Epithelial ovarian cancer is a heterogeneous disease which includes several histologic subtypes with different genetic profiles and clinical behavior [9, p. 292; 12, p. 918]. There are two general types of ovarian carcinoma according to the molecular pathogenesis [7, p.1512; 11, p. 152]. The first type includes low-grade serous, mucinous, endometrioid, and clear cell carcinomas. These tumors are characterized by a high frequency of mutations of KRAS, BRAF, ERBB2, CTNNB1 and PIK3CA, and a 5-year survival of approximately 55%. Type I ovarian carcinomas has cystadenomas for precursor lesions. Type II tumors include high-grade serous carcinoma, malignant mixed mesodermal tumors and undifferentiated carcinomas. They are characterized by a high frequency of mutations in TP53, and a high proliferative index [15, p. 98; 22, p. 408]. 60 to 80% of ovarian epithelial malignancies are high grade serous carcinomas [14, p. 5283]. In approximately 90% of the inherited cases of high grade serous carcinomas are detected mutations in BRCA1/2. The standard treatment in these cases is prophylactic salpingo-oophorectomies before the age of 40 years of the patients. Currently, there are no effective screening programs for ovarian carcinoma. For most women, the lifetime risk of developing ovarian cancer is ,1.7%. However, for women carrying BRCA1 or BRCA2 gene mutations, that risk increases to 56% and 27% respectively [2, p. 39]. Approximately 75% of all ovarian cancer cases are in an advanced stage at the time of diagnosis. Because of the advanced stage, precursor lesions have usually not been identified in these cases. In the last years, increasing evidence has indicated that tubal fimbria lesions are candidates to be precursor lesions of ovarian high-grade serous carcinomas [3, p. 74]. This theory is supported by the evidence that premalignant precursor lesions labeled by the ‘‘p53 signature’’, a benign-appearing population of cells harboring DNA damage and p53 mutations, have been found in the fallopian tubes [4, p. 6116]. The exact role of the Fallopian tube in ovarian carcinogenesis is still unclear. Fallopian tube cancer is divided into primary and secondary carcinoma. Secondary malignancies include tubal metastasis of ovarian or endometrial cancer [10, p. 320]. Epithelial-mesenchymal transition has an important role in the ovarian metastases. This process refers to changes in the cell phenotype from an epithelial to a mesenchymal morphology. In ovarian carcinoma metastasis, initially, the epithelial cells undergo epithelial-mesenchymal transition, lose E-cadherin-mediated cell-cell interactions, and up-regulate other cadherins (N-cadherin, P-cadherin) as part of the “cadherin switch” [5, p. 5962; 19, p. 174]. Epithelial-mesenchymal transition allows the cancer cells to survive in hypoxic conditions [8, p. 1443]. The loss of E-cadherin leads to up-regulation of the fibronectin receptor, which provides the adhesion of ovarian carcinoma cells to the secondary site [20, p. 1675]. A 64 years old woman presented with abdominal discomfort and pain for 2 months was admitted to the department of Obstetrics and gynecology in Pulmed Hospital — Plovdiv. The ultrasound examination showed bilateral adnexal formations with diameter 15 cm and fluid in the abdominal cavity. During the surgical intervention were found: solid-cystic left adnexal tumor formation, attached to the sigmoid colon, right adnexal tumor formation and 3-4l. ascites. A total hysterectomy was performed. The postoperative period was normal. The specimens were fixed in 10% formalin and embedded in paraffin. Serial sections cut from the paraffin-embedded blocks were used for routine histopathology with Hematoxylin-Eosin staining and immunohistochemically analyzed for the expression of E-cadherin. Macroscopically were found bilateral adnexal tumor formations with solid and multicystic areas, 15cm in diameter of the left and 5cm of the right adnexal formation. The histologic examination revealed: 1) CIN ІІ in the uterine cervix, 2) endometrial polyp and leiomyoma with degenerative calcification and 3) bilateral high grade serous ovarian carcinoma with solid and necrotic areas, with infiltration of the fibrous capsule and the surrounding fat tissue (Fig.1). There was luminal tumor infiltration of the right Fallopian tube, without infiltration in the tubal wall (Fig.2). 4) Implantation metastases in the omentum were also found. Fig. 1. High grade serous ovarian carcinoma, H-E, magn. х 40. Fig. 2. Luminal tumor infiltration of the Fallopian tube, H-E, magn. х 40. The immunohistochemical expression of E-cadherin in the ovarian part of the tumor showed different results depending on the tumor area: 3+ (high-intensity immunoreactivity of more than 10% of the tumor cells) in the papillary- more differentiated- parts (Fig.3) and 1+ (low-intensity immunoreactivity of more than 10% of the tumor cells) in the solid poorly differentiated parts (Fig.4). The immunohistochemical expression of E-cadherin in the tubal part of the tumor showed similar results: 3+ for more differentiated areas and 1+ for solid areas. Fig. 3. Immunohistochemical expression of E-cadherin in high grade serous ovarian carcinoma, magn. х 400: 3+ (high-intensity immunoreactivity of more than 10% of the tumor cells). Fig. 4. Immunohistochemical expression of E-cadherin in high grade serous ovarian carcinoma, magn. х 400: 1+ (low-intensity immunoreactivity of more than 10% of the tumor cells) in solid areas. Fig. 5. Immunohistochemical expression of E-cadherin in tubal infiltration of ovarian carcinoma, magn. х 400: 3+ (high-intensity immunoreactivity of more than 10% of the tumor cells). Fig. 6. Immunohistochemical expression of E-cadherin in tubal infiltration of ovarian carcinoma, magn. х 400: 1+ (low-intensity immunoreactivity of more than 10% of the tumor cells) in solid areas. Ovarian cancer is heterogeneous collection of subtypes with different histologic and molecular characteristics. The most common histologic type diagnosed for ovarian cancers is serous carcinoma, which corresponds to ,80% of ovarian cancer cases in developed countries [21, p. 43]. The most common subtype, high-grade serous carcinoma, is responsible for the majority of deaths from ovarian cancer [1, p. 174]. Three anatomical sites are the potential origin of high grade serous carcinomas: the ovarian surface epithelium, the fallopian tube epithelium, and the mesothelium covering the surface of the peritoneal cavity [13, p. 1058]. In almost all cases of surgical specimens derived from prophylactic salpingo-oophorectomies, the tumors involved the fallopian tubes instead of the ovaries, and intraepithelial tubal neoplasias were present in the fimbria region. When the end of the terminal fimbriae were systematically processed and examined, the incidence of fimbrial intraepithelial neoplasias increased to as much as 17% [17, p. 234]. Primary fallopian tube carcinoma (PFTC) is rarely seen clinically due to hidden lesions and often is accidentally detected during other gynecological surgeries [18, p. 7]. Criteria of Hu et al. modified by Sedlis traditionally are used for determining fallopian tube origin for tumors synchronously involving the tube and ovary [5, p. 5962]: (1) the main tumor is in the tubes and arises from the endosalpinx; (2) the histologic features reproduce a tubal pattern; (3) if the wall is involved, the transition between benign and malignant tubal epithelium should be demonstrable; and (4) the tube contains more tumor than the ovary or uterus. In the presented case the main tumor arose from the ovaries and was bilateral. The tumor part in the right Fallopian tube was smaller in size and intraluminally located, without tumor implants on the tubal serosa and without infiltration in the tubal fibrous tissue. Because the tubal wall has considerable flexibility, even if the tube is filled with fluid or tumor, the tubal wall can still remain quite complete [16, p. 314], as in the presented case. Because of the stimuli for tumorigenesis, which are identical for the ovaries and the Fallopian tubes, we share an opinion that the ovarian and tubal tumors in the presented case are developed simultaneously. The advanced stage do not allow us to differ the tumor mass as ovarian and tubal carcinoma. Significantly different level of the immunohistochemical E-cadherin expression can help us to distinguish the different grade of the tumors cells inside one and the same tumor. 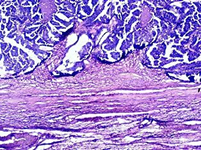 The immunohistochemical examination in the presented case showed decreased E-cadherin expression in the solid areas of both ovarian and tubal parts of the tumor, which refers to epithelial-mesenchymal transition of the solid areas. No difference was found in the level of E-cadherin expression in the ovarian and tubal part of the tumor. The last result can be explained by the development of mesenchymal-epithelial transition in the tubal part of the tumor, which gives an explanation of the high E-cadherin expression in the tubal tumor formation. The investigation of Xuyin Z. et al. showed significantly lower E-cadherin expression in the fimbriae of high-grade OSCs than those of low-grade OSCs . Their results suggested important biological differences in the behavior of the fimbria in high- and low-grade OSCs and indicate that the proliferation, cell adhesion and inflammatory microenvironment of fimbriae of high-grade OSCs without STIC had changed prior to p53 mutation [23, p. 1011]. The exact role of the Fallopian tube in ovarian carcinogenesis is still unclear. The immunohistochemical expression of E-cadherin in ovarian and tubal carcinoma should be evaluated in connection with the tumor grading and staging and considered with the process of epithelial-mesenchymal transition. Agoff S. N., Mendelin J. E., Grieco V. S. et al. Unexpected gynecologic neoplasms in patients with proven or suspected BRCA-1 or -2 mutations: implications for gross examination, cytology, and clinical follow-up. Am J Surg Pathol 2002;26:171–8. Crum C. P. et al. Lessons from BRCA: the tubal fimbria emerges as an origin for pelvic serous cancer. Clin Med Res 2007; 5: 35-44. Diniz P. M., Carvalho J. P., Baracat E. C. et al. Fallopian tube origin of supposed ovarian high-grade serous carcinomas. Clinics 2011;66(1):73-76. Hartwich Y., Gurrea-Soteras M., Sumi N. et al. Ovulation and extra-ovarian origin of ovarian cancer. Scientific reports, 4 : 6116. Hu C. Y., Taymor M. L., Hertig T. Primary carcinoma of the fallopian tube. Am J Obstet Gynecol 1950; 5958-67. Hudson L.G., Zeineldin R., Stack M.S. Phenotypic plasticity of neoplastic ovarian epithelium: unique cadherin profiles in tumor progression. Clin Exp Metastasis 2008, 25:643–655. Ie M. S., Kurman J. Ovarian tumorigenesis: a proposed model based on morphological and moleculargenetic analysis. American Journal of Pathology, vol. 164, no. 5, pp. 1511–1518, 2004. Imai T., Horiuchi A., Wang C. et al. Hypoxia attenuates the expression of E-cadherin via up-regulation of SNAIL in ovarian carcinoma cells. Am J Pathol 2003, 163:1437–1447. Ioka A., Tsukuma H., Ajiki W. et al. Ovarian cancer incidence and survival by histologic type in Osaka, Japan. Cancer Sci 2003;94(3):292–6. Jim B., Santos J., Spath F. et al. Biomarkers of diabetic nephropathy, the present and the future. Curr Diabetes Rev 2012, 8:317–328. Kurman R. J., Ie M. S. Pathogenesis of ovarian cancer: lessons from morphology and molecular biology and their clinical implications. International Journal of Gynecological Pathology, vol. 27, no. 2, pp. 151–160, 2008. Kurman R. J., Shih I. Molecular pathogenesis and extraovarian origin of epithelial ovaria cancer—shifting the paradigm. Hum Pathol 2011;42(7):918–31. Lengyel E. Ovarian Cancer Development and Metastasis. The American Journal of Pathology, Vol. 177:1053–1064;, No. 3, 2010. Levanon K., Crum C., Drapkin R. New insights into the pathogenesis of serous ovarian cancer and its clinical impact. J Clin Oncol 2008;26(32):5284–93. Lynch H. T., Casey M. J., Snyder C. L. et al. Hereditary ovarian carcinoma: Heterogeneity, molecular genetics, pathology, and management. Molecular Oncology, vol. 3, no. 2, pp. 97– 137, 2009. Ma Y., Duan W. Clinical and survival analysis of 36 cases of primary fallopian tube carcinoma. World Journal of Surgical Oncology 2014, 12:311-19. Medeiros F., Muto M. G., Lee Y. et al. The tubal fimbria is a preferred site for early adenocarcinoma in women with familial ovarian cancer syndrome. Am J Surg Pathol. 2006;30:230-6. Mulvany N. J., Arnstein M. B., Ryan V. A. Prognostic significance of fallopian tube cytology: a study of 99 endometrial malignancies. Pathology 2000, 32:5–9. Patel I. S., Madan P., Getsios S. et al. Cadherin switching in ovarian cancer progression. Int J Cancer 2003, 106:172–177. Sawada K., Radjabi A. R., Shinomiya N. et al. C-Met overexpression is a prognostic factor in ovarian cancer and effective target for inhibition of peritoneal dissemination and invasion. Cancer Res 2007, 67:1670–1680. Seidman J. D., Horkayne-Szakaly I., Haiba M. et al. The histologic type and stage distribution of ovarian carcinomas of surface epithelial origin. Int J Gynecol Pathol. 2004;23:41-4. Shaw P. A., McLaughlin J. R., Zweemer R. P. et al. Histopathologic features of genetically determined ovarian cancer. International Journal of Gynecological Pathology, vol. 21, no. 4, pp. 407–411, 2002. Xuyin Z., Jingxin D., Xiang T. et al. Biomarker expression in normal fimbriae: Comparison of high- and low-grade serous ovarian carcinoma. Oncology letters 4: 1008-1012, 2012. Ovarian carcinoma is the most lethal gynecologic malignancy. 60 to 80% of ovarian epithelial malignancies are high grade serous carcinomas, which refers to type ІІ ovarian carcinoma. High grade serous carcinoma is also the subtype seen in cases of primary peritoneal and fallopian tube carcinoma. In the last years, increasing evidence has indicated that tubal fimbria lesions are candidates to be precursor lesions of ovarian high-grade serous carcinomas. The exact role of the Fallopian tube in ovarian carcinogenesis is still unclear. The processes of epithelial-mesenchymal and mesenchymal-epithelial transition have an important role in the ovarian metastases. The immunohistochemical expression of E-cadherin as a part of the mentioned processes may be helpful for clarification of the pathogenesis in ovarian and tubal primary carcinomas.